Be inspired by the ever-turning cycle of life in this mesmerizing and vivid tarot. The Wheel of the Year Tarot ushers us through the four seasons—a passage of time marked by hope, abundance, reflection, and rebirth—and reminds us of our indelible connection to the earth. Vibrant watercolor imagery, rich in detail and symbolism, transport us to a timeless realm steeped in the beauty and wisdom of nature. 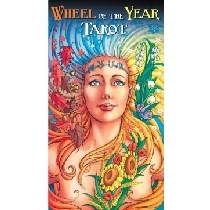 Pagans and anyone seeking guidance on love and relationships, finance and career, aging, health, and spiritual matters will find it in this stunning Rider-Waite-based tarot. Boxed deck (2 3/4 x 4 3/4) includes 78 full-color cards and instruction booklet.